July 9 Update: This was also the warmest June on record at Norfolk, Virginia. The average temperature of 80.3° broke the old record of 80.1° in 1943. The Atlantic City June average temperature of 75.8° broke the old record of 74.9° set in 2008. The number of days with 90° or higher temperatures was 14, which broke the June record of 11 in 1991. Atlantic City records began in 1874. The June average temperature of 75.4° in Trenton was the second warmest on record, just 0.1° less than the 75.5° in 1943. The 10 days with temperatures of at least 90° was just one less than the record in 1925 and 1943. Trenton records began in 1893. The average temperature of 78.2° in Philadelphia broke the old record of 78.0° in 1925 and 1994. The 15 days with temperatures of at least 90° tied the record set in 1943. Philadelphia records began in 1872. June 2010 was the warmest on record at the Charleston airport (83.4°) and the third warmest in downtown Charleston (83.3°). At the airport, 25 days were at 90° or above, including the last 21 consecutive days of the month. Downtown temperatures were 90° or above on 14 days. Airport observations date back to 1938, and downtown records began in 1870. The Greenville-Spartanburg average of 80.8° in June was the second warmest on record, behind the 82.2° in 1952. This was only the 4th time since records began in 1893 that temperatures there have averaged 80° or higher in June. The average temperature of 83.7° at Columbia tied the record of June 1952. Columbia records began in 1887. June temperatures were the second warmest on record at Savannah. The average of 83.6° was tied with June 1952. There were 25 days with temperatures of 90° or above, including 20 consecutive days from the 10th through the 29th. Savannah records began in 1870. The June average temperature of 83.8° at Tallahassee was tied with 1952 as the second warmest June on record. There were 25 days with temperatures of 90° or above. The second warmest June at Tampa (84.8° vs. 85.5° in 1998) combined with the 4th warmest May (80.9°) to produce the warmest May-June in history (82.8° vs. the old record of 82.3° in 1998). Tampa records began in 1890. St. Petersburg had its warmest June (86.5° vs. 84.9° in 1998) following its warmest May (82.0° vs. 81.3° in 1995) to produce its warmest May-June by a wide margin (84.2° vs. 82.0° in 1935). St. Petersburg records began in 1914. The June average of 84.8° at Lakeland broke the record of 84.5° in 1998. This combined with the 4th warmest May (80.6°) to result in the warmest May-June on record (82.7° vs. 82.5° in 1995). Lakeland records began in 1915. Sarasota combined its second warmest June (83.5° vs. 83.9° in 1998) with its 3rd warmest May (79.6°) for its record warmest May-June (81.5° vs. 81.2° in 1998). Sarasota records began in 1911. Ft. Myers had its second warmest June (85.3° vs. 85.9° in 1981) and its second warmest May (81.2° vs. 82.0° in 1995). This resulted in its record warmest May-June (83.2° vs. 82.5° in 1981). Records began at Ft. Myers in 1902. Key West's average temperature of 85.9° broke the old June record of 85.4° set in 1886. There were 14 daily records broken during the month; 13 of those were record warm minimum temperatures. Key West records began in 1871. Raleigh average of 81.5° broke 2008 record of 80.7°. There were 22 days with temperatures of 90° or higher, second only to June 1952 with 23 (normal is 10). Greensboro average of 79.8° broke 1952 record of 79.0°. There were 17 days with max temperatures of 90° or higher, second only to June 1944 and 1952 with 20 (normal is 8). Washington, DC was far from alone in experiencing record heat for the month of June. In Richmond, the monthly average of 81.1° was 7.6° above normal and nearly 2° above the old record of 79.2° in 1943. The difference between the new and old records is greater than the difference between the old record and the current 11th warmest June. This June was warm enough to be tied with the 10th warmest July. The last 3 consecutive months have now been in the top 10: April (4th warmest), May (8th warmest), and June (top warmest). The spring average (March/April/May) was also the warmest on record. Richmond temperature records began in 1880. The National Weather Service reports that 3 out of the 4 primary climate reporting stations in south Florida (Miami, Ft. Lauderdale, and Naples) had their warmest June on record. In Miami, the average of 85.6° was the warmest for any calendar month in history. The low temperature failed to go below 80° for 13 days in June, breaking the old record of 12 in 1998. The previous month was also the warmest May on record. Ft. Lauderdale's average of 84.9° was a new June record, and the 15 days with lows of 80° or higher broke the old record of 12 in 2008. The Naples average of 84.6° broke the old record from 1944 by 0.5°. The Palm Beach average of 84.4° was the second warmest June, missing the 1998 record by only 0.1°. The 10 days with lows of 80° or above broke the old record of 8 in 1981. Central North Carolina also set June records; details later. 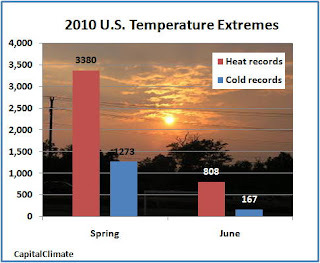 Image (click to enlarge): Total number of daily high and low temperature records set in the U.S. for spring 2010 (March-April-May) and June 2010, data from NOAA National Climatic Data Center, background image © Kevin Ambrose. Includes historical daily observations archived in NCDC's Cooperative Summary of the Day data set and preliminary reports from Cooperative Observers and First Order National Weather Service stations. All stations have a Period of Record of at least 30 years. June 30, Midnight Update: The low of 67° has held through midnight, so the final record-breaking June average is 80.6°. June 30, Late PM Update: The June 30 high is in at 81°. If the low of 67° holds, the month goes into the books at a record-blasting average of 80.6° (charts to be updated when final figures available). With today's high above 80°, there were only 3 days this month which failed to reach at least 80°. This is the smallest number for June since 1996. Despite the pre-canned assertion elsewhere that "highs below 80 seem likely in many spots", Washington Dulles and Baltimore also reached 80° or above for the day, with Baltimore Inner Harbor at 84°. Regionally, even Martinsburg WV (80°) and Hagerstown MD (84°) achieved the Big Eight-Oh-Plus. In fact, as of 5 pm, these additional secondary reporting stations in Maryland and Virginia were all above 80°: Winchester, Frederick, Leesburg, Staunton, Aberdeen, Culpeper, Blackskburg, Fredericksburg. June 30, PM Update: Following yesterday's high of 92° and low of 78°, the June monthly average reached 80.8°. Today's high so far of 78° and low of 67° virtually assure that the final June average will be at least 80.5°, which is a remarkable 1.1° above the old record. The histogram chart of all June average temperatures from 1871 through 2010 shows how far an outlier this month has been. 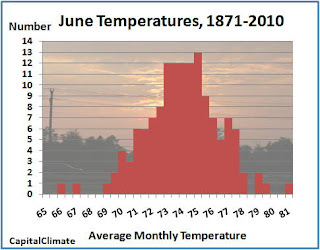 Each bar represents the number of times the June average was in a given 0.5° range. The point at the far right of the chart shows the 2010 average in the 80.5°-81° bucket. The 2010 value is an impressive 2.8 standard deviations above the overall average. June 30, 1 AM Update: The temperature is 78° at 1 am, so the 80° low won't hold, but it didn't miss by much. June 29, Late PM Update: Despite a north to northwesterly breeze, the temperature is still holding at 90° as of 7 pm. June 29, PM Update: The final high and low for the 28th were 97° and 73°, respectively. As of 2 pm, today has already reached 92°. This is the 18th day with 90°+ this month, which is apparently a new June record. The morning low was 80°, but that is likely to be surpassed by midnight (technically, 1 am EDT). The monthly average through yesterday is 80.6°. That will increase if the low later today is anywhere above 70°, but it will go down a little with lower temperatures tomorrow. June 28, 6:30 PM Update: Added records for Richmond, Elizabeth City NC, and Wallops Island VA below. June 28, 5:30 PM Update: The high was 97° at 1:27 pm; the low is being reported as 70°, but this is inconsistent with the time shown of 8:56 am. The high was 3° short of the daily record, but Baltimore set a record of 99° (old record 98° in 1969). This is now the 3rd daily high set this month in Baltimore, tying the 3 each in June 1925 and 1994. Baltimore has also tied a record high a record high on the 23rd and a record high minimum on the 24th. Richmond blew away its 1959 record by 3° with a high of 102°. Richmond records began in 1871. Elizabeth City NC tied a record at 97°. Wallops Island VA, where records only began in 1963, smashed the 2001 record of 94° with a high of 98°. 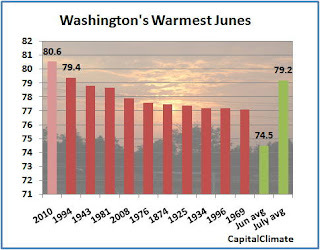 This is the 17th day of 90° or higher temperatures at Washington this month, which reportedly ties the June record set in 1943 and 1994. An expected high in the low 90s tomorrow would break the record. There have also been 7 days of 95° or higher; there were only 5 days 95°+ in 1994 and 3 in 1943. In 1981, the previous 3rd warmest June, there were 9 days of 90°+ and 4 of 95°+. June 28, 4 PM Update: The Washington temperature dipped at least as low as 73° during the thunderstorm. If that remains the low for the day, the June average to date will be 80.6°. June 28, 2:30 PM Update: The temperature at Dulles has already dropped in a heavy thunderstorm to 79° from a high of 94°. Meanwhile, the temperature at Washington National rose to at least equal the high of 96° before the storm. June 28 PM Update: Strong thunderstorms moving into the area will drop the temperature, but the high so far today is 96° as of 2 pm. The low so far of 81° would break the daily record for high minimum, although it's likely to be breached. Assuming the low holds, however, the monthly average to date would rise to an even 80.75°. 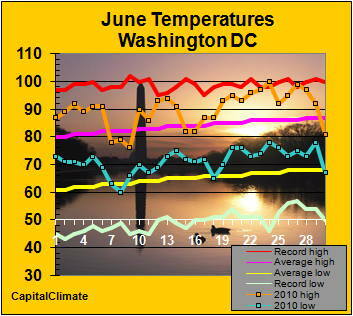 A new daily record high temperature of 99° for June 27 at Washington, DC has further extended the June monthly average into record heat territory. The previous record for the date was 98° in 1980. With the morning low of 75°, the June average to date is now 80.5°, over 1° above the old record of 79.4° in 1994. This is a greater margin than the difference between June 1994 and the current 3rd place holder, June 1981. Although a cool-down is likely by Wednesday, this month is now virtually assured to clinch the record with the first June in history to average above 80°. There have now been 16 days this June with highs of 90° or above. With a forecast high in the mid 90s, Monday will likely tie June 1994's count of 90°+ days. The high of 100° at Baltimore also set a record, exceeding the 99° in 1952. Richmond's high of 102° exceeded the old record of 100° in 1952. For earlier history of this month's record temperatures, see here.